If you’d prefer to use a web browser other than Safari as the default on your iPhone, iPad, or iPod touch, you can do so with a simple utility called BrowserChanger. The tweak lets you set any of the alternate web browsers as the iOS default, allowing any link to launch directly in something like SkyFire rather than copying and pasting the URL manually. Now before everyone gets too excited, notice that BrowserChanger requires a jailbreak to install. Jailbreaks are easy to perform and just as easy to undo, but it does add an additional layer of complexity for the average user. 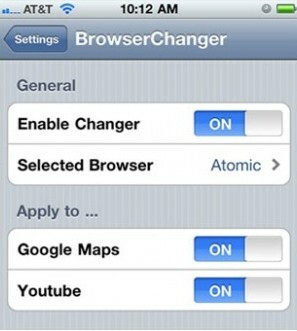 BrowserChanger is a free download from Cydia, search for it in the ModMyi repository. You’ll find there are also options to apply the default browser change to Google Maps and YouTube. This is an older tweak but @TaimurAsad reminded me of it’s existence.